Olive Garden passes are personalized and not for resale. 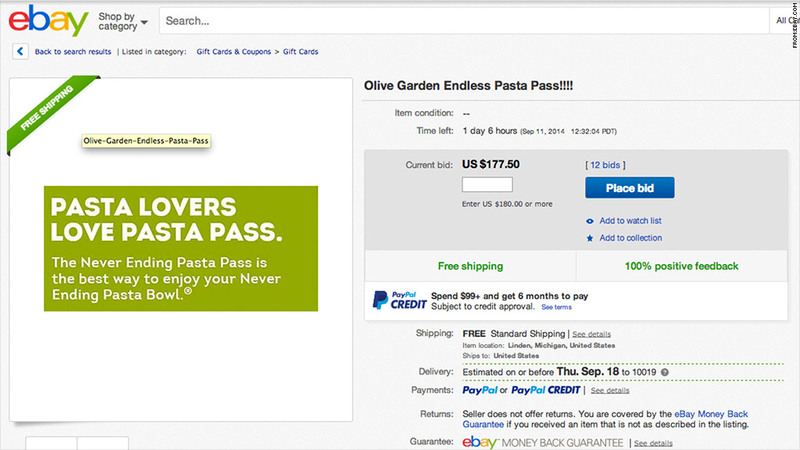 Olive Garden's all-you-can-eat pasta passes are already for sale on eBay, but buyers should beware. The restaurant is working with eBay to inform users bidding for the coveted "Never Ending Pasta Pass" that the passes can't be resold. Anyone who has already purchased a pass on eBay should call the company to find out how to proceed, according to Tara Gray, a spokeswoman for Darden (DRI), which owns the restaurant chain. "We're a hospitality company, so we're going to make things right," said Gray. She added that the passes are "personalized" with the original buyer's name, so no one else can use them. Olive Garden offered the $100 passes on its website Monday, and sold all 1,000 of them in just over one hour. The passes are valid from Sept. 22 to Nov. 9. There were about 55 of of the passes for sale on eBay (EBAY) Wednesday morning at prices well-above face value. One seller is asking as much as $300, and another auction has already gone as high as $187. By midday there were just 21 of the passes listed on the auction site. Anyone who bought a pass directly from Olive Garden gets an unlimited amount of pasta for seven weeks, along with toppings like chicken and shrimp fritta. Diners can also wash it all down with an infinite supply of Coca-Cola (CCE)soft drinks. The special offer is an advanced version of the Never Ending Pasta Bowl, an annual, limited-time, all-you-can-eat pasta deal for $10. Customers consumed 13 million bowls of pasta during last year's promo, according to the company. Olive Garden has more than 800 restaurants and employs 96,000 people, with annual sales of $3.6 billion.